Please help our community — upload your photos of 19117040. This is an antenna, mobile telephone (analog & digital) (includes inr/otr coupling, antenna mast, alcohol padding, instruction sheet) (acdelco #19117040), for Chevrolet, Chevrolet Trucks, Buick, Buick Trucks, Oldsmobile Trucks, Cadillac Trucks, Saturn, Pontiac, Oldsmobile, Cadillac, and GMC Trucks automobiles. It fits for 255 General Motors vehicles which were sold in the U.S. from 1996 to 2006. It's a genuine General Motors part with an OEM part number 19117040, and corresponding ACDelco part number 19117040. This antenna has a weight of 1.92 ounces, usually, it comes in a set of 1 item in retail packaging. Bulk packaging option for wholesale buyers is a pallet of 5000 units (UPC-A: 70707773409953). In spite of higher price of genuine parts buying this antenna will be a smart decision because you will be absolutely sure that it will serve you longer and will provide maximum safety and performance for your car. This antenna 100% fits for General Motors cars. It's made of top quality materials, it has passed not only all manufacturer's tests but also General Motors quality control and has to endure rough road conditions over a long time. This antenna comes in retail packaging with weight of 1.92 ounces. Pallet packaging contains 5000 units in retail packaging and has a UPCA code 70707773409953. All the data on these charts reflect users search interest in GM 19117040 part based on search requests on oemcats.com website made between 2012 and 2018 years. Search interest in GM 19117040 part aggregated by months over time. 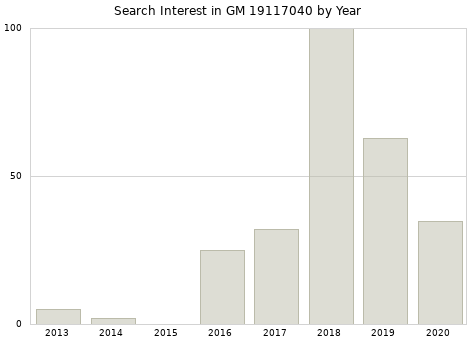 Monthly average search interest in GM 19117040 part over years from 2013 to 2018. 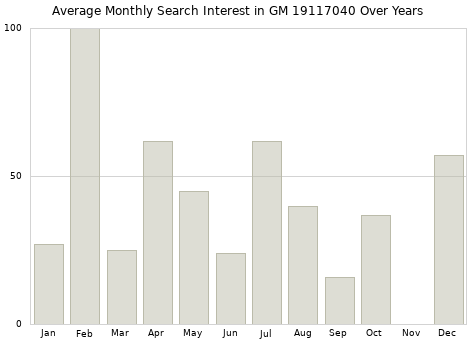 Annual search interest in GM 19117040 part. GM 19117040 monthly average sales over years from 2014 to 2018. GM 19117040 part annual sales from 2014 to 2018. 12450007 was replaced with 12450807 on September 1, 2000 for the U.S. market.